I gotta tell you, there’s nothing’s more fun and rewarding for pooches and peeps to do together than pet therapy! It’s a blast and I bet your beast would be head over paws happy doing it too. I never feel better than when I got my vest on and I’m prancing around a place dispensing my mutt medicine. I’m gonna tell you all about pet therapy and how you can get going with it too. First off, there’s a variety of places you guys can visit–it’s not just hospitals. You can also frolic around schools, libraries, senior centers, day care centers, group homes and many other places. There are also special events that come up where our therapy teams get requests to participate, such as the Special Olympics. And sometimes reoccurring things, like a children’s cancer camp, which I went to several times (below is a camp photo with those cute costumed kids). Your canine doesn’t need special obedience training. I didn’t have any, and Greg, uh, well, he ain’t the sharpest knife in the drawer. So if us average guys can pass the certification test–a bet you and your furry friend can too. At the lower section of this page, I put the evaluation test drills for you to check out. Human’s also have to read a manual and take a 20 question multiple choice test. It’s open-book so no problemo there. There’s different ways to get hopping with this pet therapy thing. You can go with a national or a local pet therapy organization, or you can get with a local facility such as a hospital or school. 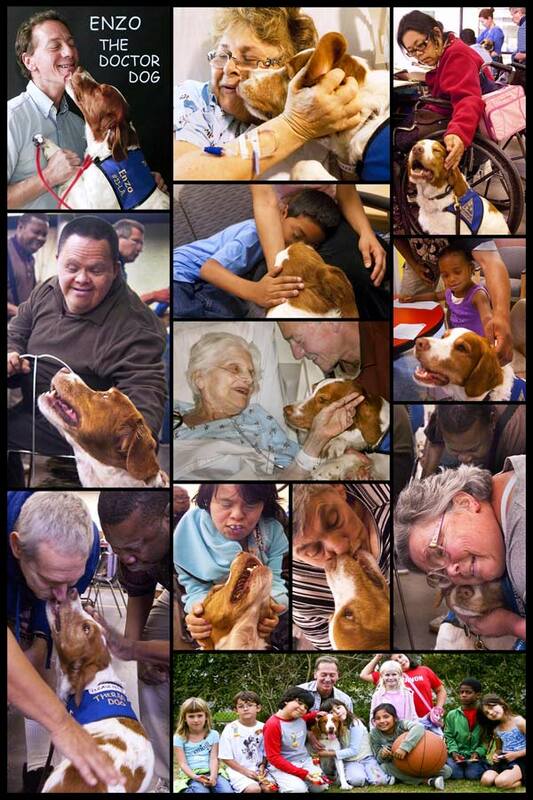 The two main national therapy organizations that I know about are The Delta Society and Therapy Dogs International. Depending on where you live, there may also be local affiliates of these national organizations which you can then join after you complete the requirements of the national body. You can also look for local independent therapy groups in your area. If you’re in the Los Angeles area, Love On 4 Paws is a fine inde group which a few of my pals belong to and rave about. I decided to go with The Delta Society and then joined their southern California affiliate Paws4Healing and I’ve found the peeps and pooches there to be utterly funtastic. I have to add that Delta probably has the most difficult evaluation test. You shouldn’t even think of taking the evaluation test though unless you take the time to practice the drills ahead of time. I practiced a lot. Several times I felt like biting Greg cause he forced me to do the drills over and over but it turned out to be one of his few good ideas. Honestly, I don’t think I would’ve passed on my first try if we hadn’t worked on it a bunch. Once you get good at the drills, you should go do them at places with lots of distractions. We went to several malls and dog parks. Keep in mind that if you don’t pass the first time, you can try again at another time. Also keep in mind that you have to do all the stuff without getting any treat rewards. I hated that rule. Grrr. Arf! Hey there, all my fine canines. I gotta tell you this therapy stuff is the best scam us beasts can score! I kid you not. The humans are all confused and think this is some kind of volunteer job thingy. But it’s really a play thingy. A definite play thingy. Look, first off, we get to go to a bunch of places we usually get kicked out of. You can cruise around libraries, schools, hospitals and other places you’ve never been allowed into. There’s plenty of new scents and sights and sounds to relish. And when you get there, the peeps go crazy and treat you like rock stars–just for showing up. It’s incredible. You score so much petting, hugging, snuggling and kissing–that you amass your entire monthly canine affection quota in just one visit. Everybody wants to shower you with love and play with you and give you treats. Oh, speaking of food, here’s a hot snatching tip–you just gotta visit special needs kids. Besides being more appreciative than average kids, they often drop pieces of their snacks on the floor and don’t notice it and you can scarf it up easy. Also, some are napkin challenged, so there’s tidbits on their face and when you kiss them, you lick up instant treats at the same time. Cool tip, huh? Speaking of which, I’m reminded of the time I saw this little girl in a wheelchair who was looking so sad and just staring vacantly into space. She wasn’t responding to nobody or nothing. Then I walked up to her and wagged my tail and did the cute pooch routine, but still nothing. But being the determined therapy beast I am, I didn’t give up and went into full-on kissing mode. I was licking and licking that face like there was no tomorrow and soon an actual smile slowly crinkled up her face. And then her vacant eyes blinked awake and looked right into mine. It was so great it’s hard to describe. Kinda like your fur tingling all over from fresh ocean breezes while you eat a delicious steak garnished with ice cream. Yep, this therapy stuff is a win-win all around the place. So go along with the humans’ shtick and pretend it’s work, and practice the test exercises so you can pass on the first try. Then it’ll soon be time for tons of fun on the canine therapy trail. I’ll be looking for ya. Good luck, my mighty mutts! To be registered as a Delta Society® Pet Partner®, you and your animal must be evaluated by a licensed Delta Society® Pet Partner® Evaluator. The evaluation process consists of the Pet Partner Skills Test (PPST) and the Pet Partner Aptitude Test (PPAT). To test basic good behavior skills, animals and their handlers complete the PPST. This test was modeled, with permission, after the American Kennel Club’s Canine Good Citizen (CGC) Test. Health care equipment, such as wheelchairs and walkers, has been added to the test. Skills are evaluated for how well the team can manage in an unfamiliar setting, such as a nursing home, hospital, school, etc. There are 12 items in the PPST. The PPST is also used for screening cats and other animals. These animals do not perform all of the test items in the same way. For example, instead of walking on a leash, rabbits and cats must show that they can be carried in a basket or in the handler’s arms. The Pet Partners Aptitude Test (PPAT) determines if you and your animal have the ability, capacity, desire, and potential for participating in animal-assisted activities (AAA) and animal-assisted therapy (AAT) programs. This part of the evaluation is similar to what many people would call a temperament test. Delta did not use the word “temperament” because so many people think that animals are born with a certain temperament and it can never be changed. We know that with training, many animals can learn to be reliable. For this reason, we use the word “aptitude” to suggest that the test applies to the animal’s ability or potential for AAA/AAT. The PPAT also evaluates the aptitude of the animal/handler team. The PPAT is a combination of scenarios in which the individual exercises flow from one to another. The order of the exercises allows for escalation of stressors during testing. During the PPAT, the handler and animal should interact (i.e., role play) with the evaluator and assistants as though they are people being visited at a facility. The handler should be able to work with the animal while at the same time interacting socially with the “client” (evaluator and assistants) as if on a visit. Food treats cannot be used during the test. The team may be given up to 3 attempts to successfully complete skills of the PPST, but only if the mistake is due to handler error. Each attempt must be on a different day. Individual exercises may be attempted only one time per evaluation, unless the a problem is caused by the evaluator. Collars and Leashes may not have any chain type material. Head collars may not be used. Slip collars may not be used.